Oh how time flies. Just over a year ago the team at High-Touch decided we wanted to get involved with the tech community by participating and engaging through popular social channels. We started by creating optimized profiles on Facebook, Twitter and LinkedIn. 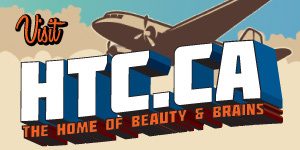 We also launched this site, the Beauty & Brains blog, to share HTC’s expertise with our growing following. Today, Beauty & Brains celebrates its first birthday. To commemorate, we’re taking a look back at our progress in a special anniversary post. One thing that has become clear over the past year is that posts offering instructive, actionable information create value for visitors. Our article on optimizing LinkedIn profiles is a great example of this. Despite being 8 months old, this post continues to attract readers seeking concrete advice on how to make the most of their LinkedIn presence. It’s rewarding for us to think that the 5 simple steps outlined in the post are still helping Beauty & Brains subscribers “link in” to new careers and opportunities. Our founder and President, Tom Kouri, will never let the HTC team forget who came up with the captivating title for this popular post. While Tom may be king around here, his post did a great job of reminding us that the real power lies with topicality and targeting. The article examines 6 steps for addressing the challenge of relevancy when planning and creating content. The product of more than 30 years of marketing experience, Tom’s insight gets to the heart of what makes great content. It’s a post we’re extremely proud of and should not be missed. Over the years at HTC, we’ve participated in the creation of meaningful brands that represent more than the sum of their parts. This is because we believe strongly that a brand isn’t just a logo, or a font, or a collection of colours and slogans. We believe a brand is a story; something authentic, consistent, lasting and lively that communicates on an emotional level. Our post on brand stories outlines our branding philosophy and emphasizes the power of great storytelling in creating a lasting customer experience. Thanks to all our readers who have helped make the first year of Beauty & Brains such a rewarding experience. Keep tuning in for our weekly publications, this month we’ll be featuring some great posts that will help you brand better. Also, if you enjoy reading Beauty & Brains, let us know what topics you’d like to see covered in the coming year in the comments below!